The Hawaiian Islands were untouched by western civilization until Captain James Cook chanced upon the island chain in 1778 during a voyage across the Pacific. 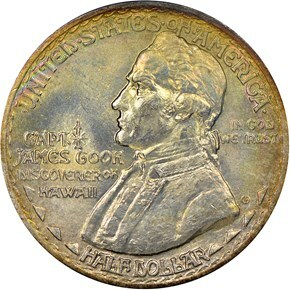 In honor of the 150th anniversary of Cook’s discovery of the islands, the people of Hawaii sought a commemorative coin which would help raise revenue to form a collection of Cook memorabilia in the then-territory’s archive. Legislation authorizing the minting of up 10,000 pieces was approved on March 7th, 1928. Before the bill even passed, designs had already been submitted to the Fine Arts Commission by Juliette May Fraser, a well-known artist from Honolulu. The coin was modeled from her designs by sculptor Chester Beach. 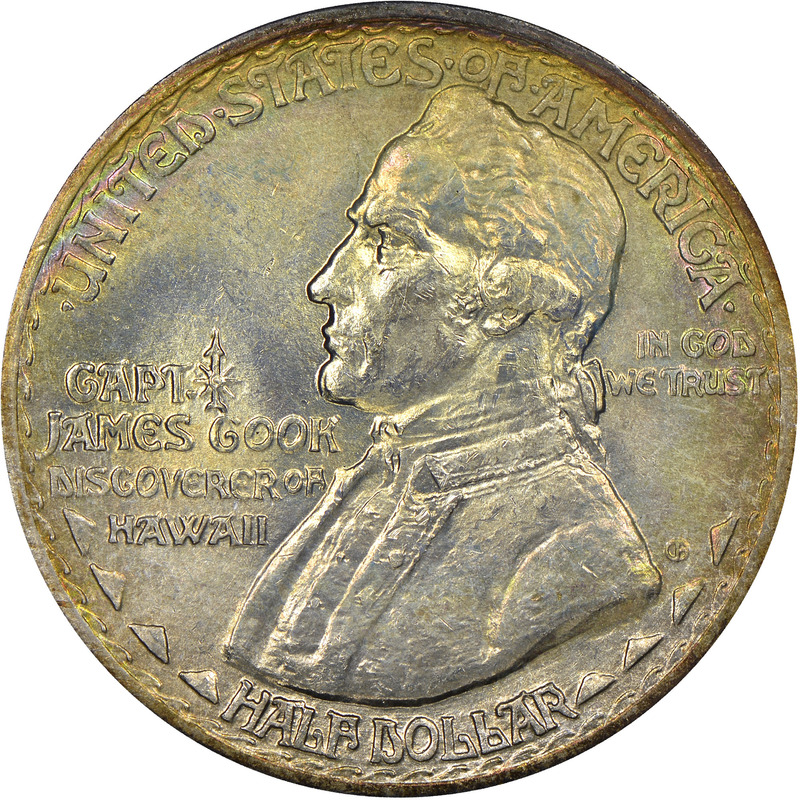 Their obverse features a left-facing bust of Cook. To Cook's left are the words CAPT. JAMES COOK DISCOVERER OF HAWAII, along with a tiny compass pointing north, signifying that he was looking due west toward the mid-Pacific region. Two statutory inscriptions, UNITED STATES OF AMERICA and IN GOD WE TRUST, appear at the top and right-hand side, respectively. The value HALF DOLLAR hugs the lower rim, with eight small pyramids—four on each side—representing Hawaii's eight largest volcanic islands. The coin's reverse depicts a native warrior chief attaining the top of a hill, a metaphor for Hawaii's rise from obscurity. He is clad in a feather cloak and holds a barbed spear. His hand is extended in welcome, showing that his intentions are peaceful. A coconut tree behind him denotes romance, while the landscape in the distance represents part of Waikiki Beach, with Diamond Head looking down on a row of grass huts. The motto E PLURIBUS UNUM is at the lower left, and the dual dates 1778-1928 are along the base, again in wavy characters symbolic of the sea. The coins were scarce from the beginning, and even with a record-high issue price of $2 each, buyers eagerly snapped up the entire mintage. Plans to sell half the coins to buyers in Hawaii and half on the mainland were dashed when most of the coins were purchased by Hawaiians. 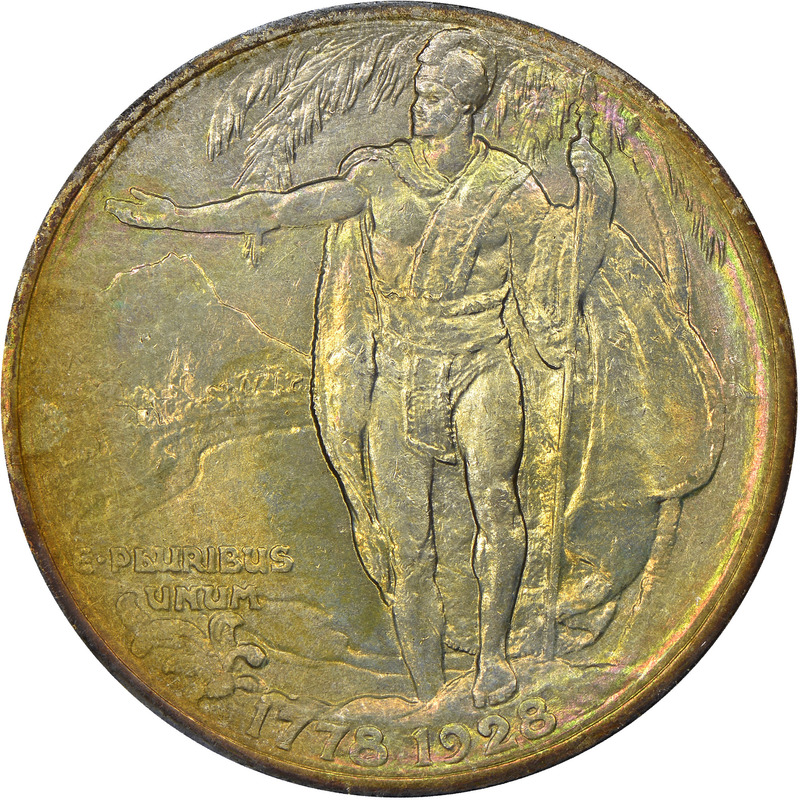 With a beautiful design and very limited mintage for the type, the Hawaiian commemorative half dollars are on of the most expensive coins of the series across all grades.